A farrowing crate is a penning system which has an area for the sows that allow them to have their babies. They have been designed to reduce the number of pigs which are accidentally laid or stepped on by the sow. Also, farrowing crates provide a cooler area for the sow and warmer areas for the young pigs. 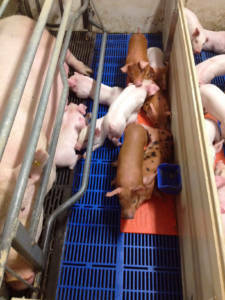 The flooring is designed to keep the pigs dry, which reduces the spread of diseases. Farrowing crates also allow us to assist in the birth process of pigs.